So, pop survey time! Hands up if you quite like fashion? Music? Events? Discounts? Free stuff? And oh yeah, how’s about chocolate, too? Well kids, we’re in for a hell of a time. There's a plethora of fun, free stuff happening around the city and just in case you haven’t already circled the following dates in the diary, get those highlighters poised and at the ready. 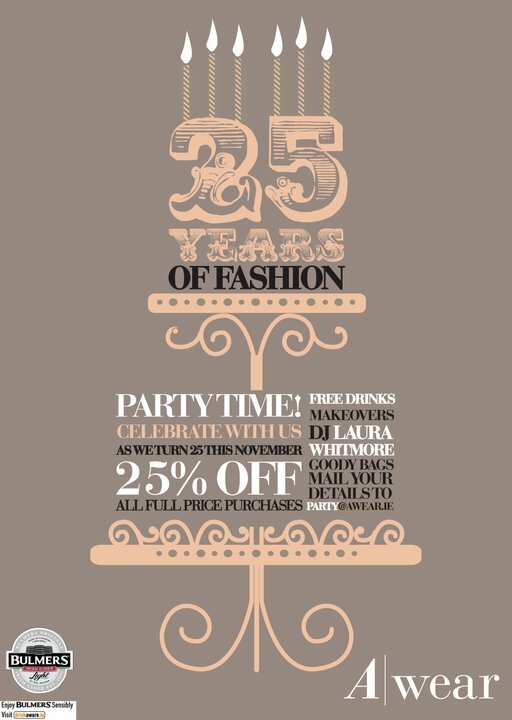 First up, I mentioned in my last post that A|wear will celebrate their 25th birthday this Wednesday with a massive party in their Grafton Street store, complete with 25% discounts, a DJ set from MTV’s Laura Whitmore, makeovers from Peter Marks and Gosh Cosmetics, a photo booth, complementary Bulmers Light and, as if all that’s not enough, there’s free goodie bags for the first 250 guests to register. Email party@awear.ie to get your name on the list. 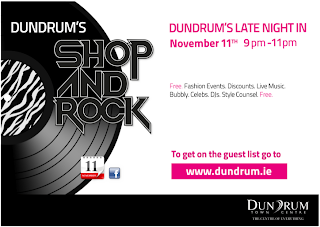 On Thursday, it’s Dundrum Town Centre’s time to rock with Dundrum’s Late Night In. 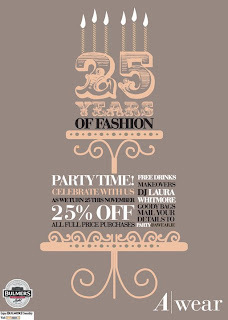 Running from 9pm – 11pm, this is another fabulous free fashion event promising discounts, live music, bubbly, celebs, DJs and more. To bag a place on the guest list head to the website to register, but be quick! The utterly wonderful Laina (who, when it comes to fun, fabulous and more importantly free events is always in the know) informed me of this next, and very exciting, event earlier today. Claudio Corallo, the creator of what the BBC called ‘the best chocolate in the world’ (yes, you read that right: the world!) will be launching in Ireland on Monday 15th at 6.30pm. This special tasting of the first fully African-made chocolate in Ireland will take place at Ely CHQ in the IFSC. Journal Chocolat says this is ‘A chocolate for people who like what is good in life’ –- and I reckon that about sums me up nicely. Claudio Corallo chocolate is being introduced with the support of the Irish fair trade organisation, Value Added In Africa, and will be distributed to gourmet shops and restaurants nationwide by Sheridans Cheesemongers. If you want to come along -- and really, why wouldn’t you? – head on over to their Facebook page now. 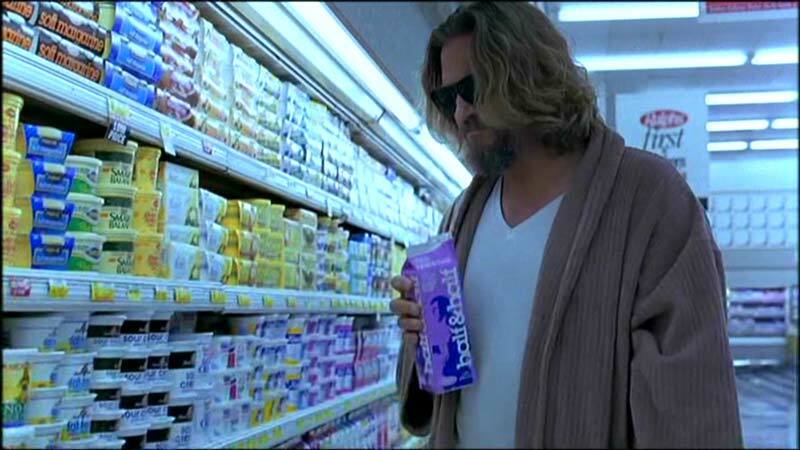 And as it happens, on that very same evening and as part of their Screen Hearts 90s series, The Screen Cinema on Dolier Street is running a dress-up special of one of my very favourite films of all time: The Big Lebowski. It is to this film that I partially attribute my full-blown love affair with that king of cocktails and ultimate hangover cure, the White Russian – I say partially, because having them available for two quid in my Glasgow local didn’t hurt, either. It starts at 8.30pm so there’s just enough time to leg it over and burn off a little of that chocolate. This one isn't free but at €9 for an adult, €6.50 for a student and a mere €5 if you're dressed as The Dude, it still sounds pretty sweet to me. Okay, first things first: you are shaming me with your long, info-laden posts. Secondly, are you going to Dundrum shop 'n' rock on Thursday? The end. A/wear sounds fantasmic, woohoo. also YEAY CHOCOLATE. what an informative and delightful post. high five! I'm loving the sound of the Screen's Hearts 90s series. I reckon I'll be taking myself to Pulp Fiction! Is dress-up included in all of them? @Dave, thanks for the link, it looks fantastic! @Sonya, nope, afraid not, just The Big Lebowski as far as I can tell. Although Pulp Fiction would be a great one to do too and a good opportunity to dig out the oul Rouge Noir nailpolish!